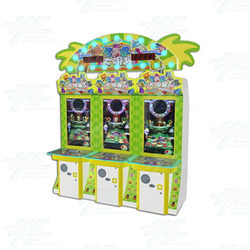 The Naughty Household game is a video redemption (either ticket out or coin out) machine from Sealy in which players shoot at the naughty, rotating animals in order to collect coins and win tickets or coins. This game uses a simple and fun rapid fire, shooter concept and bright LED lighting to attract players from all across the floor. Using a single, giant push button players wait for the coin shooter, which moves from side to side at the bottom of the screen, to line up with the animal targets and they must try and shoot as many coins as possible at the rotating animals and knock them down. Every animal they knock down turns into coins or presents when they fall onto the platform. This game uses a simple and fun rapid fire, shooter concept and bright LED lighting to attract players from all across the floor. Using a single, giant push button players wait for the coin shooter, which moves from side to side at the bottom of the screen, to line up with the animal targets and they must try and shoot as many coins as possible at the rotating animals and knock them down. Every animal they knock down turns into coins or presents when they fall onto the platform. This is a Highway Entertainment video. Footage of the Naughty Household redemption arcade machine from Sealy at the GTI Asia Taipei Expo 2013.